We are so proud to announce that our Academy of Business and Finance Academy has won in ALL the categories we had finalists. This small school-within-a-school Career and Technical Education program had the MOST finalist teams in the United States in the 2014 World Series of Innovation. Through our project based-blended learning program, we are constantly thinking outside the box, and this honor is well earned by these student teams. 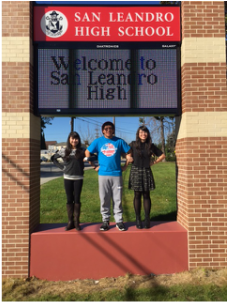 San Leandro has the MOST finalist teams in this international competition, a competition in which over 5000 entries were received in 7 categories. - Juniors Lara Friedlund, Angelo Belenson and Diana Grande with their App Design to connect entrepreneurs and businesses world-wide. WE2B"
- Seniors Sharon Pham, Kamarri Williams and Marielle Lopez with their app Design for students new to a community and wanting to fit in, and find friends and places that meet their interests in their new community called "Connect Teen"